Technology has opened the doors for retailers to connect with people on their own turf and to turn them from casual browsers to buyers with a simple touch. One huge new example comes from Target who found a way to change Instagram from a passive network into a viable sales platform—while staying true to its brand. Bottom line, this could be the kind of easy “see-it-and-buy-it” shopping we’ve been promised since the 90s and WebTV. Target wants to combine the brand’s “digitally savvy and socially connected [customer] base” with its best assets—the stores, beloved brands and phenomenal product selection. 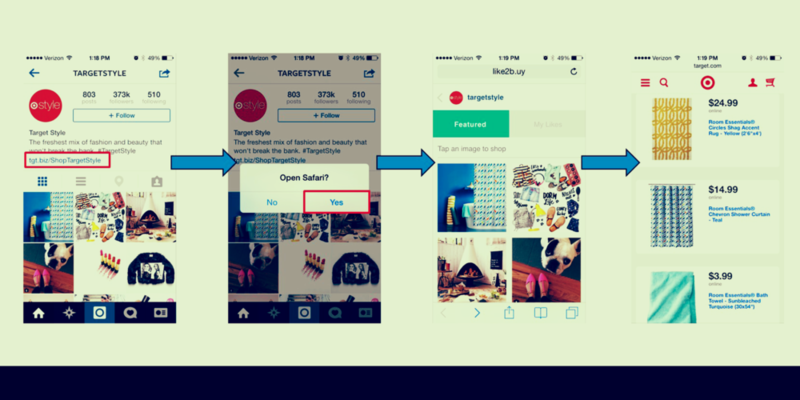 One of the ways to deliver this is allowing shoppers to purchase products featured on the Target and Target Style Instagram accounts, right from their phones. A link is placed in the description section of the Instagram account; shoppers click it and select the image containing the item(s) of interest; they are then sent to the items on Target’s website to make the actual purchase. Instagram has grown from a picture-sharing site to an inspiration hub that allows friends and mere acquaintances to share images that reflect their style—from fashion, to food, to decor—and everything in between. It is an ideal platform for melding shopping and style, and retailers would be wise to find a way to capitalize on this trend. Target, with its focus on style and design, feels like it belongs on Instagram and has found a way to connect with people in a place they are already visiting—instead of trying to create a new habit—by behaving less like a brand and more like a “normal” Instagrammer. The most important thing any brand must do is ensure that the core idea and reason behind being on Instagram (or whatever the platform du jour) stays intact. Target needs to continue featuring products and ideas that ladder up to its “Style” platform. The second Target’s followers sense this space turning into a weekly circular they’ll bail—it will cease to be a viable hub of inspiration. Party glasses, stylish fall sweaters, dorm room accessories are all great products to feature. Other products such as pancake batter, toothpaste, batteries and other “basic” products should remain in other touch points without a relevant connection to style. As long as Target continues to provide value through inspiration and affordable luxury, we should see a steady increase in the number of followers of its Target Style account. If Target’s goal is to offer a modern shopping experience across all its channels, and to allow its customers (guests, as Target calls them) to interact with Target, whenever, wherever and however they want, then this latest Instagram integration gets a thumbs up and should only be looked at as the tip of the iceberg of good things to come out of Minneapolis. As shopper experts, we think seeing any brand innovate and turn a platform around to its advantage is something important to acknowledge and learn from. Every brand feels like they have to be on every social media channel but it’s important to have a specific intention and strategy—something Target is excelling at here. Keith Katona is Momentum's Director of Shopper Marketing, based out of the Chicago office.